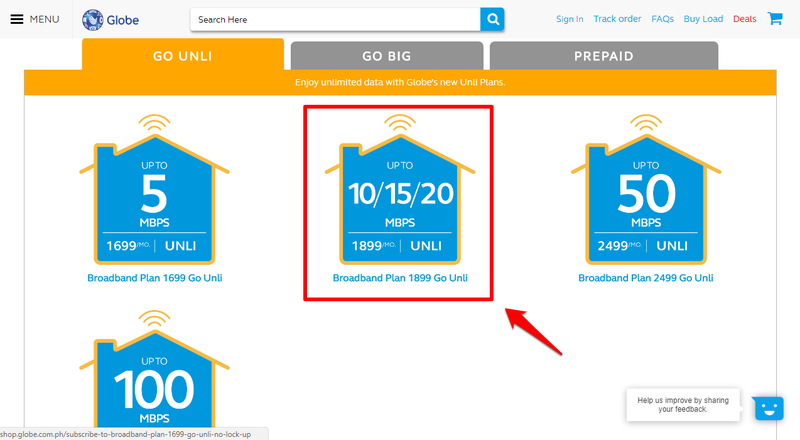 It's been a long while since I've last reviewed our upgraded Globe DSL plan which was the plan 1299 with up to 10mbps download speed. Since I work from home and I do a lot of screensharing (via GotoMeeting) and VOIP calls (via Skype), it takes up the 100GB too easily. And it.is.not.good when this happens. Since the internet connection here at home is shared by several other devices ie mobile phones, tablets, it almost always doesn't end well for me #sadlife. Anyhoo, that's when we've decided to upgrade to the 15mbps plan 1599 which gives us an additional 50GB (150GB in total) for . It was good, during the first few months, but somehow, I felt like the data consumption went a few more notches higher as it could no longer last until the end of each month (still wondering about this). Fortunately, (and expectedly) a Loyalty department agent from Globe called again (the timing is so on point) for a "free" upgrade to the 15mbps plan for 1899, without data capping. Yes, that's correct. 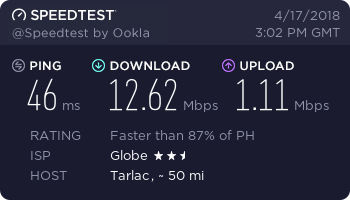 For the same speed, we pay an extra PhP300 just so we could use the internet without worrying about running out and not being able to use it for the rest of the month. So far, we haven't really experienced data capping (we're not supposed to, anyway). Everything goes smooth everyday. Of course, there's some latency being experienced when there are several devices connected and streaming videos (probably this is my son's doing--he's the only one who likes watching random YouTube videos). Apart from that, there's really nothing negative to report at this time. See that Speedtest result up there? That's made during peak hours and with me playing a 40-minute "Scandal" episode at the background. I have to be honest again, that at this point, I think Globe is finally listening to feedback from thousands of their subscibers and actually doing something about it. I do hope that this will be our last upgrade (for now), so we can all be #happycamper and get on with our daily lives. It's going to be very disappointing if somehow our usage is cranked up again just so we're forced to upgrade to a higher/more expensive plan. Anyway, if you are interested and if you're not aware of this yet, you can check out these plans through this link. Note: This is not a paid review.